People who tell me they want to write but have little to write about just don’t get it. I can think of dozens of moments—literally seconds in the vast timeline of my life—that changed me. And I’m not talking about when as a pedestrian I evaded an oncoming truck that would have flattened me, or when I stepped into an abandoned warehouse with the elevator doors closing behind me and two Dobermans snarling at me for an endless twenty seconds until the elevator opened again. No Bruce Willis moments, although those are pretty cool too. I’m thinking about the time as a ten-year-old kid I landed in Luqa Airport, Malta, after my first trans-Atlantic flight ever to meet for the first time relatives I had heard about my entire young life. I remember being tossed from one relative to another, kissed and squeezed and never before having felt so much undeserved love. Or a decade later when in the Montreux Jazz Festival, Switzerland, I heard Sonny Rollins soloing on his booming tenor saxophone during “To a Wild Rose,” making me a committed jazz fan for the rest of my life. Or only half a year later when I sat in a college classroom checking out a woman sitting next to me who I did not know would become my wife of 36 years and become the mother of my two daughters. I bring up these moments for two reasons. First, to remind anyone who wants to write that you do have plenty to write about. 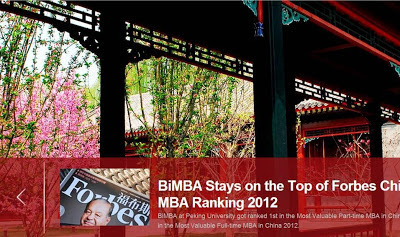 Second, to remind myself that new life-changing moments await me as I head to China next week for the first time to teach report writing and presentation skills to graduate students at the Beijing International MBA program. Writing opportunities lie everywhere: notice and record them when they happen. If you’ve got a life changer, I’d enjoy hearing about it! As demand for my course Creating Powerful PowerPoint Decks grows, WORDS ON THE LINE readers should find helpful the excellent series by the Harvard Business Review (HBR) on designing and delivering presentations. Written by Nancy Duarte, these three articles appear as promotions of Duarte's latest book HBR Guide to Persuasive Presentations. Having read her book slide:ology: The Art and Science of Creating Great Presentations, I can attest to quality of her insights into what makes a great presenter and presentation. I wrote down many important points of yours yesterday but I was most inspired by "If you get stuck, it's because you didn't plan enough." I'm truly glad that Mr. Robertson took that point to heart for two reasons, one concerning his self-development as a writer and the other as a reminder to myself as a writing consultant. First, when introducing himself to the class, he said that while he loves reading good writing, he finds writing itself a difficult, painful activity. For this reason, I give him a lot of credit for taking the course in the first place. It shows he is committed to overcoming challenges that can affect his job performance. Second, his comment is praiseworthy because he focused on an intangible learning moment, a process-related takeaway, something instructional designers shy from because they fear that learners may find process-related topics to be immeasurable, and therefore, unteachable, while product-related topics are more desirable simply because they are measurable. My 35 years of teaching writing tells me that this thinking is wrong. 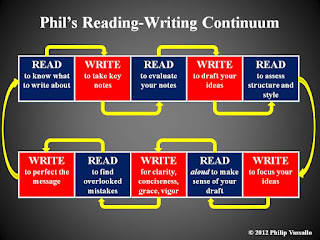 Using the writing process sensibly goes a longer way than anything else toward improving writing because it instills confidence in writers, provides multiple points of entry into problematic writing assignments, and promotes efficiency throughout the writing task. Thanks for the note, Sage! When I saw Jennifer Thompson from Selective Insurance in one of my writing classes, I immediately remembered a comment she made in a class she had with me earlier this year. She said that while she felt comfortable about her ability to get to the point, she wanted to improve her tone by putting into her written messages more "puppies and rainbows." I laughed then and seeing her again several months later, the comment remained fresh. What Jennifer meant was adding more of what I call context language, the nice-to-know or helpful-to-know information, to support the content language, the need-to-know information. Here are three examples, from different fields, of writing without context language followed by examples that try to balance content with context. Content Language Only: We do not sell that product in this store. Content Language with Context Language: We're sorry that we have run out of stock for that product because it's so popular. If you can't get to our crosstown store, we'd be happy to get one from there into our store within three days or have the store mail it to you for a nominal charge. Content Language Only: Your invoice is incorrect. Content Language with Context Language: We see a discrepancy between your invoice and our attached record of the services you provided. Would you please clarify the difference with a breakdown of the services rendered or readjust your invoice accordingly? Content Language Only: You did not send us your slide deck. Content Language with Context Language: We want to ensure that your presentation goes as expected, so please send us your slide deck today, and we will load it for you tomorrow morning. Notice the value added in the second draft of each message. In the first draft, the writer gets to the point but would be far too blunt if the relationship with the reader were not well established. In the second draft, the writer still gets to the point but provides reasoning or simple good manners. Yes, Ms. Thompson might have called context language "puppies and rainbows," but she was not downplaying its importance in driving home a message. She's smart enough to realize that she works for a client-focused company. Be sure to balance content with context. Too little context will make you come across as blunt, insensitive, or thoughtless; too much of it will make you look ingratiating, verbose, or unfocused. Thanks for the reminder, Jennifer.